The chief executive of the company behind Wales’ most ambitious commercial regeneration development Central Square, Paul McCarthy, said its first speculative office scheme is closing in on being fully let. Addressing a meeting of Cardiff Breakfast Club, Mr McCarthy also confirmed construction firm Sir Robert McAlpine has been appointed main contractor for the proposed £150m Interchange scheme at Central Square. Subject to planning consent next year, the Interchange will house a transport hub for the city alongside commercial developments. Chief executive of Cardiff-based property development firm Rightacres, Mr McCarthy, said that the decision of BBC Wales to locate its new £120m headquarters at the heart of Central Square had proved the catalyst for the success of the project. This has been underpinned by the fact that the property arm of financial services giant Legal & General recently committed to investing £400m in the scheme – that will eventually deliver one million square feet of new office, residential and leisure space in the centre of Cardiff. The 135,000 sq ft 1 Central Square office building has already signed up its first tenant in law firm Blake Morgan, which is taking around 28,000 sq ft over two floors. The building will be ready for occupancy in the first quarter of next year. Current office requirements in the marketplace include those from MotoNovo Finance, which is looking for up to 70,000 sq ft of new space in the city. Cardiff University’s School of Journalism has a 30,000 sq ft office requirement, which stipulates a need to be close to the new BBC Wales HQ. The closest building when the HQ opens in 2019 will be 2 Central Square. And he said that there would be significant contracts for local companies in the construction supply chains of both the BBC Wales and proposed Interchange schemes. ISG has been appointed main contractor for the BBC project. As well as a transport hub the Interchange will provide between 200,000 sq ft to 400,000 sq ft of A Grade office space, as well as a hotel and private residential apartments. The scheme has been designed by Foster + Partners, which also designed the BBC Wales HQ building and produced the masterplan for Central Square. 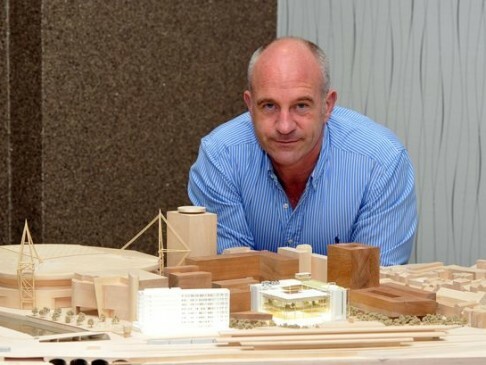 Mr McCarthy said the international firm, for which Cardiff-born Gerard Evenden has played a key on Central Square, fully understood the design briefs for both the BBC Wales and the Interchange schemes. He added:“They are a great brand architect with a real passion to do something in Cardiff. “They [Foster + Partners] came to the city and spent three days around the bus station talking to people and looking at the experience of people in the city,” said Mr McCarthy. A recent independent report estimated that the BBC HQ will have an economic impact of £1bn over the next decade , a number which Mr McCarthy believes “under-estimates” the impact the project will have not just on Central Square, but Cardiff and the wider city region. Central Square as a project took shape in 2013 following a presentation Mr McCarthy made to then Cardiff council cabinet member for finance and economic development Russell Goodway along with senior council officials and chair of the Cardiff Business Council Nigel Roberts. Cardiff Breakfast Club is sponsored by Blake Morgan, Cardiff Business Council, Lloyds Banking Group, Media Wales and Stills. Credit: Sion Barry Wales Online.